When conceptualizing the LEET™ chassis, all different sorts of materials and surface finishings were thoroughly considered. In the end, a clear decision was made in favor of aluminum which constitutes the best solution in the sum of its characteristics. It is light-weight, durable, corrosion resistant, odorless, and 100% recyclable. The LEET™ full aluminum chassis has a one-piece shell with an unmatched wall thickness of 0.2 inches (5 mm). In the production process, all exterior parts are hand-brushed, making every chassis one of a kind. As a final step, all parts are anodized to increase the natural corrosion-resistance and to give the chassis its final color and unrivaled finish. 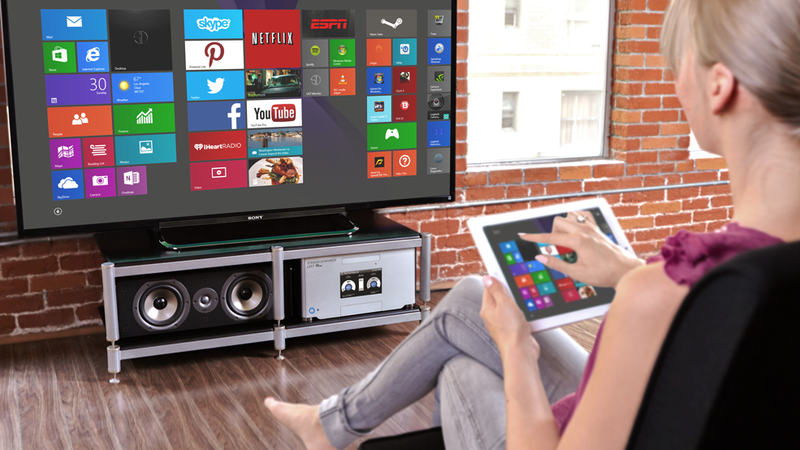 This makes it a perfect match for existing home theater devices and a valuable enhancement to the living room. The LEET™ chassis has enough room and cooling capacity to handle all current high-end configurations with up to E-ATX motherboards and Quad-SLI (2x GTX 690). 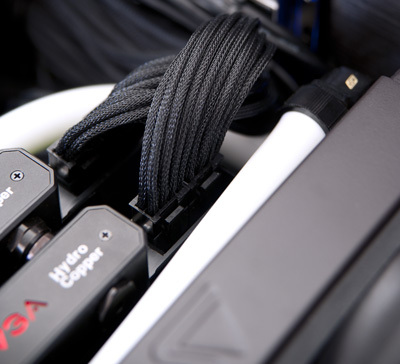 The chassis can hold up to 3 full-size graphics cards. 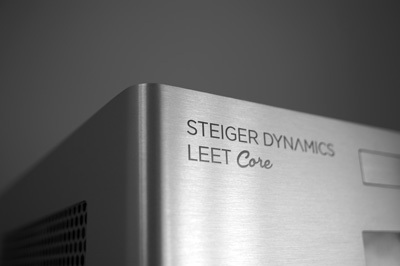 The LEET™ chassis is the world's first Home Theater PC chassis designed for liquid cooling solutions. 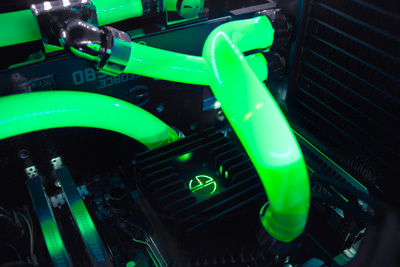 Compared to standard air cooling used in regular PCs, liquid cooling dissipates heat extremely efficiently. This allows for optimal performance while making the system ultra-silent - exactly what one would expect from a living room computer. For ultimate performance, efficiency, and aesthetics, the LEET™ chassis can be fittd with the Steiger Dynamics LEET™ custom liquid cooling solution, co-developed with Swiftech, leading manufacturer of advanced cooling components. 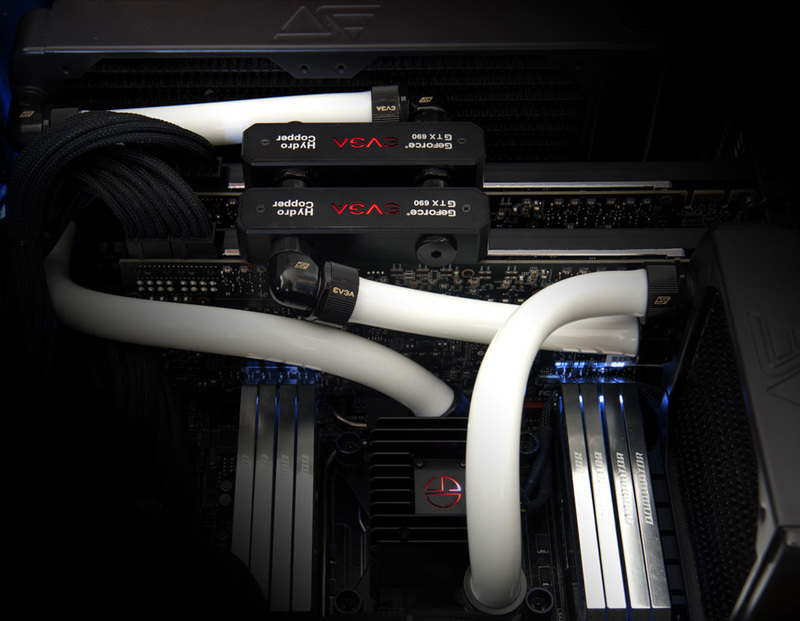 The LEET™ custom liquid cooling solution consists of a combined pump/CPU-block, one single and one dual-radiator, and allows the integration of graphics cards into the cooling loop. Furthermore, it allows for the creation of one's own interior color scheme, by customizing tubing and fitting colors. The LEET™ chassis can alternatively hold pre-sealed 120 and 240 mm liquid cooling solutions. The LEET™ chassis is available with an optional fully transparent lid window, allowing the setup to be displayed in style. The large acrylic window features the same clean design as the chassis itself, and has a completely flat outer surface without any plastic bezel or rivets. For interior chassis lighting, switch-activated light strips are available in different color options. They feature 66 LEDs, illuminating the system's interior directly or indirectly (UV-light). The window has a size (W x D) of 14.4 x 12.4 inches (365 x 315mm), positioned 1.6 inches (40 mm) from both the side and the back edge. Pursuing a no-compromise approach, the LEET™ chassis can be optionally configured with highest quality custom-made cables and cable management for the drives and the power supply unit. These cables are custom-tailored to precisely fit the chassis. 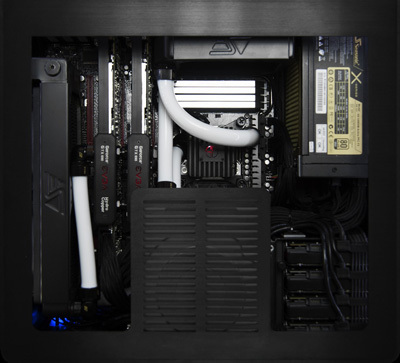 This avoids any cable excess, accounting for an extremely clean look and optimized air flow, helping to keep chassis temperatures down. 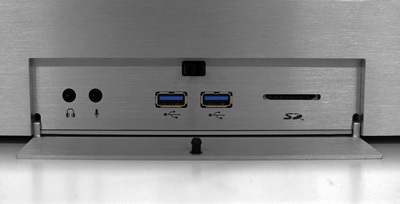 The system’s integrated 7” Samsung front screen shows the exclusive LEET™ Monitor App, an integral part of the chassis design. The pre-configured app is customizable via a comfortable user interface and is designed to be easily readable from the couch. It has a clock function and constantly monitors system parameters such as uptime, used and available drive space, RAM capacity utilization as well as CPU/GPU clocks, load levels, and temperatures. This function is implemented with PC enthusiasts and overclockers in mind - always eager to have current system parameters at hand. In addition, the LEET Monitor App allows you to dim or completely turn off the display when watching movies in a dark environment. The LEET™ chassis can be configured with up to 3 SSD drives, allowing for optional RAID configuration (Redundant Array of Independent Disks). In RAID 1 mode, one drive is mirroring the other, providing maximum data security and double read speeds. 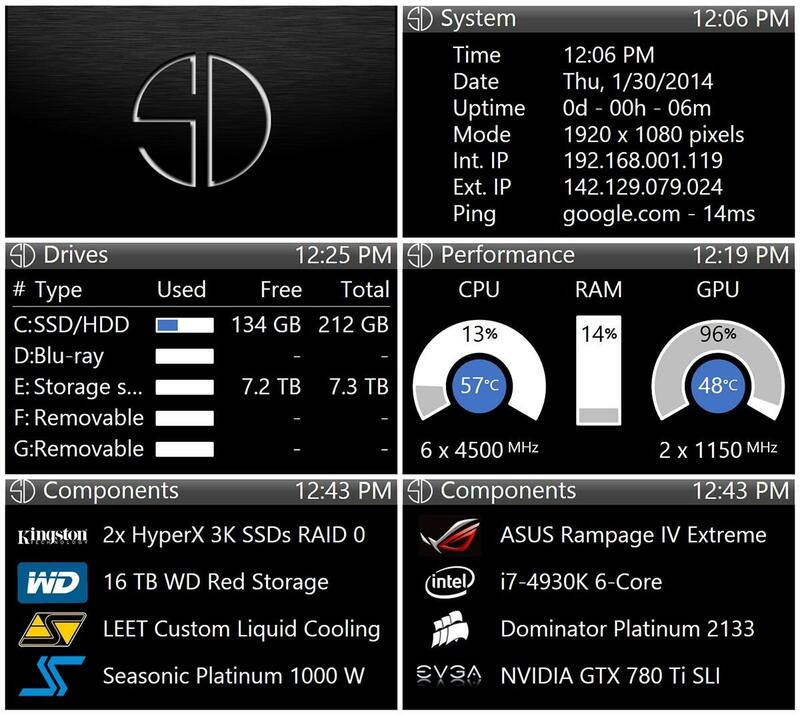 In RAID 0 mode, both drives are combined to one logical drive, doubling read/write speeds and IOPS (Input/Output Operations Per Second) of one drive. 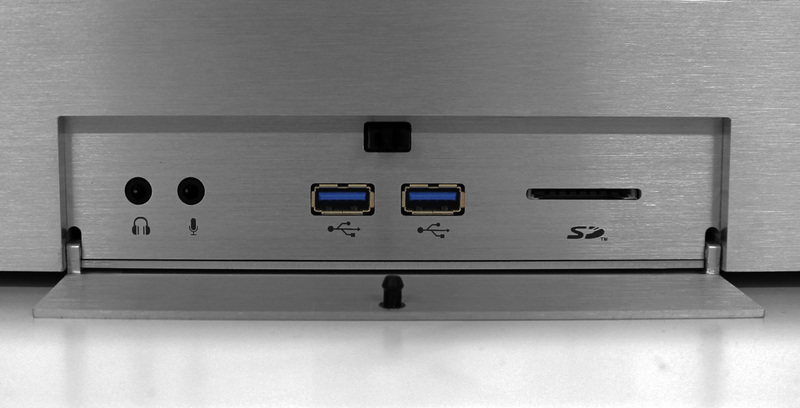 The LEET™ chassis is able to accomodate up to four 3.5 inch hard disk drives. Due to its mechanical design, hard disk drives are naturally prone to transfer vibrations to the chassis and components. 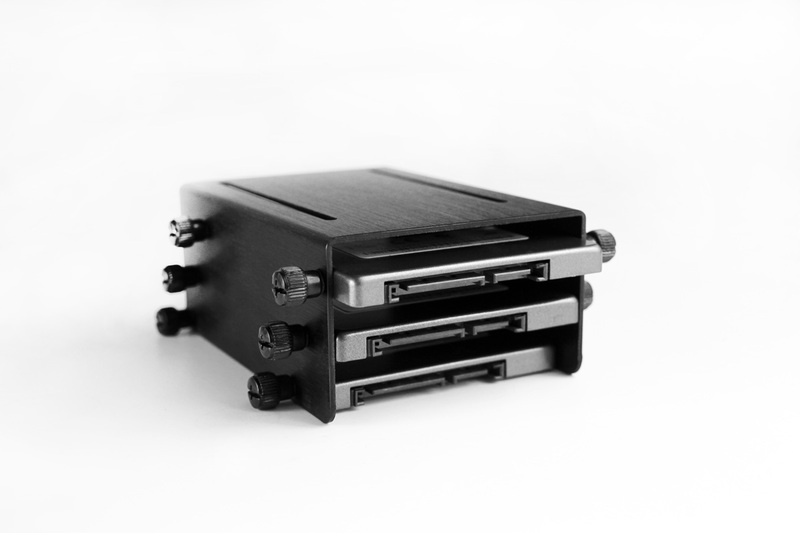 In the LEET™ HDD cage, all drives are rubber-cushioned and hence, completely isolated from their aluminum surroundings. This solution effectively eliminates vibrations and consequently reduces overall system noise.